LPG or Liquefied Petroleum Gas is a flammable mixture of Hydrocarbon gases used as a fuel for heating, powering plant, machinery and also for vehicle fuel. In the UK LPG is sourced from one of 6 refineries or can be imported by ship from refineries around the world. Propane is produced as a by-product of two other processes, natural gas processing and petroleum refining. LPG is colourless and odourless but normally a stenching agent is added called ethyl mercaptan which carries a very strong and recognisable smell. LPG is explosive between a gas air mixture of 1.8% to 10%. Propane is the type of LPG mainly used in the UK due to its ability to operate at a temperature level down to -42c. In the UK LPG supplied into tanks for heating your home is commercial grade Propane, but in warmer climates it may be mixed with Butane or other Hydrocarbons. Butane is mainly used within a property for portable heating and may also be used to power a BBQ or patio heater. Butane will only operate at above -2c so is unsuitable for outside use in winter months. How is LPG Gas Stored? LPG is stored in either a tank or cylinders under pressure. When stored at pressure LPG becomes a liquid. When delivered by tanker LPG is pumped in a liquid form and this is recorded by the LPG delivery meter. Your gas tank will never be filled above 87% as this will allow room for thermal expansion of the gas if ambient temperatures were to rise. When LPG is delivered by meter it must be temperature compensated so that the customer always receives the correct delivery amount. Temperature compensation is carried out automatically by the delivery vehicle meter. This means that whatever outside temperature it is on the day of your delivery, you will receive the correct amount. In the UK all tanks and cylinders should be fitted with a PRV (pressure relief valve). This device will only operate in exceptional circumstances and will let a controlled amount of gas to escape the cylinder if pressure becomes too high. This would normally only happen if a cylinder was involved within a fire or stored in unsuitable conditions such as a greenhouse in hot weather. LPG tanks are usually supplied in sizes ranging from 600kg to 2000kg. Other sizes are available but may be a special order. LPG tanks can either be installed above ground or using a special tank can be installed underground. A percentage gauge is fitted to the top of the tank so that the consumer can check when they need to re-order. The larger the capacity of a gas tank the more gas vapour per hour it can produce. When installing a new tank Carver Gases will require the BTU offtake of all your appliances to advise you the best size of tank for your usage. Underground tanks do produce significantly less vapour than their above ground equivalent. Gas cylinders come in a large range of different sizes, the largest size 45kg are used for the heating of homes or for use in commercial or industrial applications. A 45kg cylinder can produce up to 95,000btu. When used for heating homes more than one cylinder is usually required to be connected at at time. It is important that the correct size and quantity of LPG cylinders are used for your appliance as incorrectly matched cylinders may cause your appliance to run incorrectly producing dangerous fumes such as carbon monoxide. Also, if your cylinder is too small for your appliance the gas will boil off too quickly and the cylinder will stop working even with LPG is left inside. Special cylinders with a liquid offtake are used to power many Forklift Trucks, these are available at Carver Gases and cannot be used for any other use.They are usually used in a horizontal position with a dip tube installed inside allowing the vehicle to use the liquid LPG instead of vapour. Autogas is widely used as a greener fuel, as its use reduces CO emissions by around 15% compared to petrol. Autogas is not used extensively within the UK but is the third most used vehicle fuel in the world with 16 million vehicles powered using LPG. Autogas can be found at many Forecourts within the UK and is popular for Taxi and Private Hire vehicles. Refilling your vehicle with LPG is a similar process to filling up of petrol. Autogas is available from our Littles Lane site in Wolverhampton. Our Autogas filling station is situated near the entrance of our site. 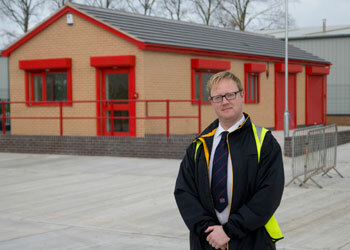 Payment can be made within our gatehouse allowing for a quick and easy fill up. If you want to find out more contact our LPG department. LP Gas is the most convenient of all off mains fuels and can be used in more applications than oil. LPG can be used for cooking, water heating and central heating boilers, all available in LPG versions. A full range of Gas fires and Wood burner effect appliances are also available. LPG is a much cleaner fuel when compared to oil, emissions are lower, refilling is cleaner with no spills or unpleasant odours sometimes found when running oil systems. LPG does not pose a risk to ground or water pollution and releases less CO per unit of energy than coal or oil. LPG appliances are also more reliable and need less servicing than their oil system counterparts. If you currently live in an area of the country that may be affected by power cuts in extreme weather conditions, consider the fitting of an LPG feature fire. LPG requires no external power source for it to work, no pumps are required for LPG to reach your home. As long as you have gas in your tank you can continue to keep warm in the event of a power cut using your LPG feature fire. 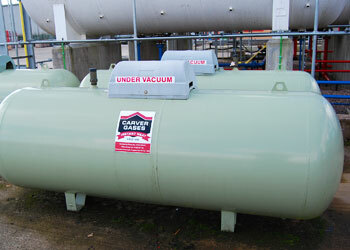 With LPG from Carver Gases your tank will be maintained by us as part of your hire agreement. All servicing and repairs to the vessel are free of charge. In the event of your tank needing replacement, this is also carried out at no cost to the consumer.